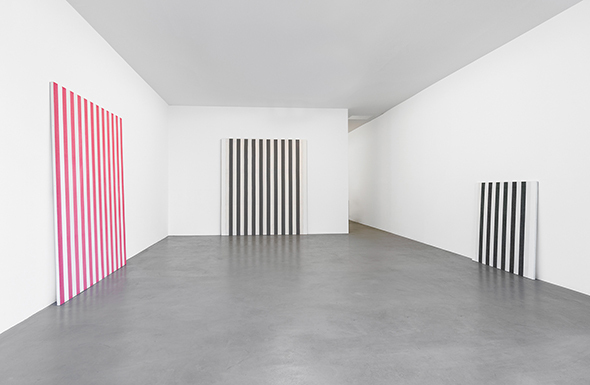 Daniel Buren – Peintures 1966-1969, Travaux Situés, 2016. Installation view, Buchmann Galerie Berlin, 2016. The works made of awning cloth, which Daniel Buren bought in the Marché Saint Pierre in Paris, also mark the start of his in-situ artworks, which he created all over the world and which use 8.7 cm wide vertical stripes as a signature visual code. The repetitive use of these stripes eliminates any form of representation. The placing of stripes of white acrylic paint on the edge of the picture refers to nothing other than itself—and constitutes an endpoint of painting. Daniel Buren places the pictures on the ground like objects, thus adding to their self-referentiality by appropriating the space in which they are shown. Over 100 works by Daniel Buren are installed permanently throughout the world, such as Les Deux Plateaux in the inner courtyard of the Palais Royal in Paris. In 1986 Daniel Buren was awarded the Golden Lion for his French Pavilion at the Venice Bienniale and the Praemium Imperiale in 2007. Daniel Buren is not only renowned worldwide for his impressive in-situ realised works, but also for numerous writings and interviews in which he employs his critical insight into art and its underlying conditions.